There are countless shrines, temples and tiny votive sites throughout Dharavi. Given that the largest part of this neighbourhood was developed relatively recently (in the late nineteenth century and after the 1950s), it provides a clear model from which to chart out how temples and other religious structures are created in 20th century Indian society. Furthermore, the dense development patterns and continual migration of residents reveal how religious sites function in unplanned and ethnically diverse urban neighbourhoods. 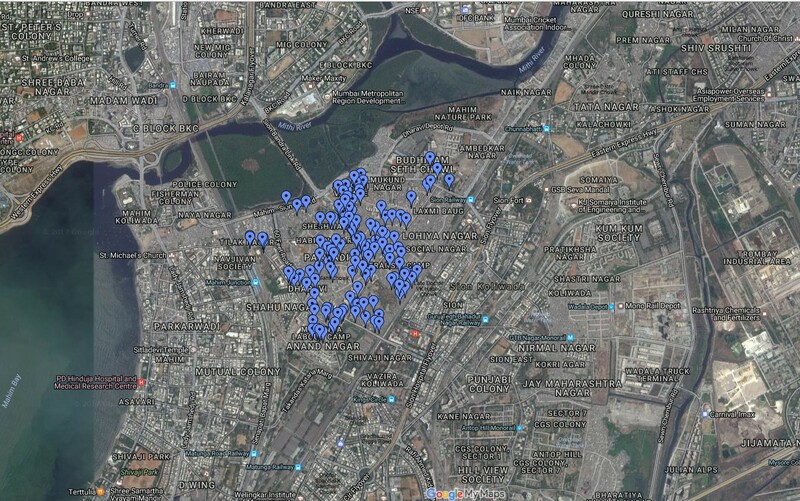 This preliminary research is the result of 15 days of mapping, interviewing and cataloguing religious sites from one end of Dharavi to the other. It was conducted with URBZ research associate Shyam Kayle and myself. There are clearly limitations in this work, including the predominance of Hindu temples, and the lack of in-depth social and historical investigation. However, the results are very intriguing and call for more concerted efforts to be made in telling the stories of the religious sites in this unique area. I have highlighted certain themes that emerged from my time in Dharavi any of which could become the basis for more detailed study. Choosing which deity to honour with a temple is not a straightforward process. There are a variety of reasons that a particular deity is selected including: the occurrence of a miracle associated with that god; a stone or other physical feature that resembles that god; a specific tree or plant associated with a god in the vicinity; the hometown ties of the residents; or simply because the residents wanted a temple and had to choose a god to dedicate it to. It seems that more often than not the reason a specific deity is chosen is based on the ethnicity or background of the local residents: i.e. the selection of a god associated with a distant home village. However, sometimes a deity is chosen simply because local residents have a fondness for him or her irrespective of their specific geo-cultural background. The rise in popularity of certain deities at the expense of others is clearly displayed in the choice of gods in Dharavi’s temples. Older areas tend to have more obscure and caste specific or community specific gods featured in their temples while newer Hindu religious sites in Dharavi tend to have more famous and popular deities enshrined such as Sai Baba and Hanuman. The large Muslim community in Dharavi is well represented by mosques, which are evenly distributed across the neighbourhood. Like their Hindu counterparts, these religious sites range in size from small storefronts to large compounds. 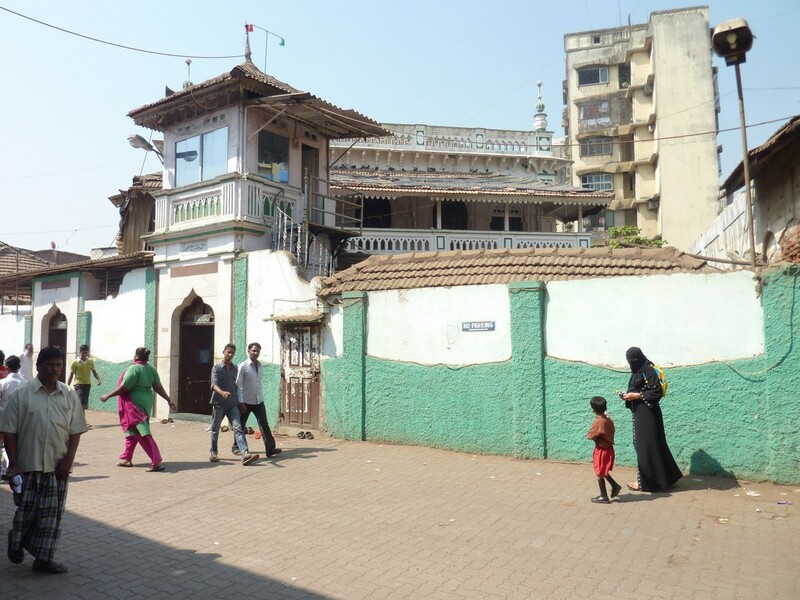 The oldest mosque in Dharavi, is the Sunni Jama Masjid on the Dharavi main road. There are also two darghas in Dharavi at either end of the neighbourhood. These small shrines are not particularly ornate, nor do they appear to be highly patronized but little else was discovered about them, making studying the stories behind the Darghas of Dharavi an important part of a future research. Christian churches are concentrated in the Koliwada area of Dharavi. The Kolis, a community of fishermen who are the original inhabitants of the area, have had a long relationship with Catholicism dating back from their first encounters with Portuguese colonizers. 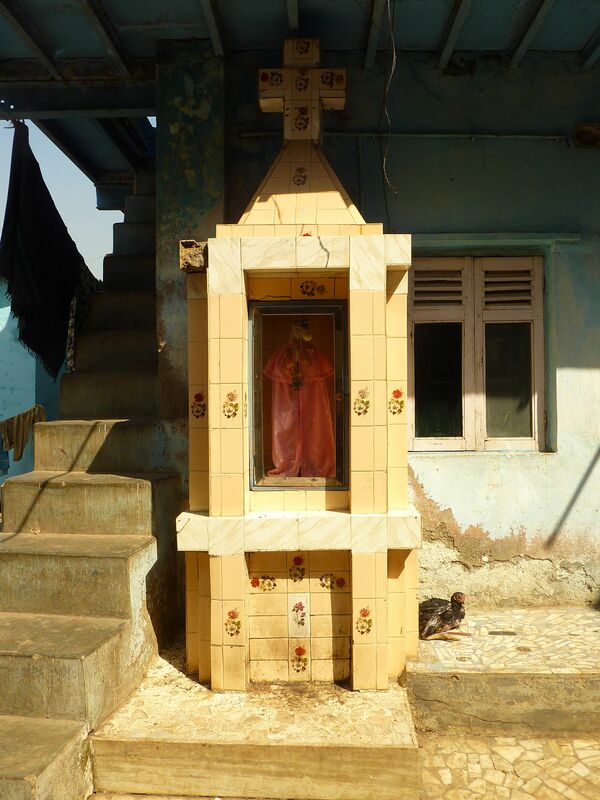 Religious sites in the Koliwada area have a characteristically Indian flavour with small shrines dedicated to the virgin Mary that are virtually indistinguishable from Hindu religious sites in other areas. The area has its share of large churches and small shrines as well as numerous small Christian worship spaces that exist inside of the homes of local residents. These informal religious spaces have no signage or indication of their dual purposes. 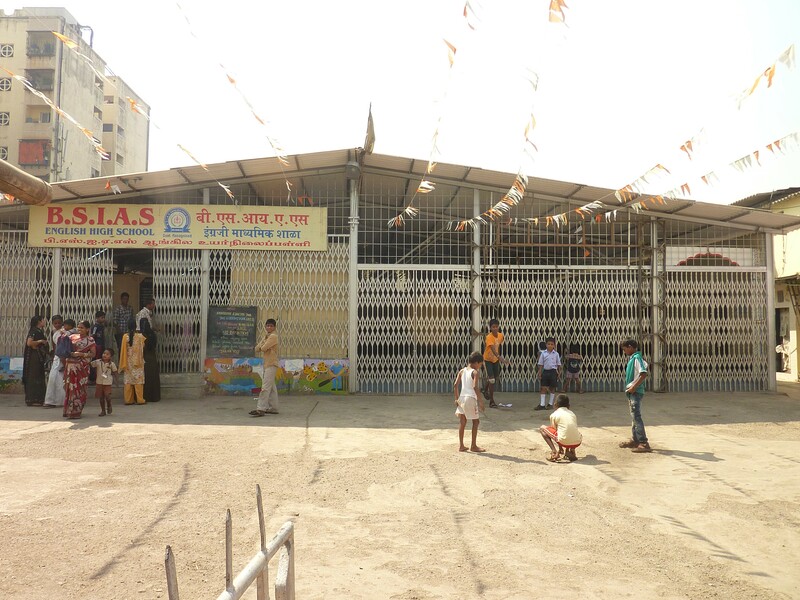 Most, but not all, temples in Dharavi are managed by a ‘society (1).’ These groups are responsible for founding, upkeep, maintenance and security of a local temple or shrine. A society is usually made up of local devotees who contribute funds and manage the temple. The borders of these ‘societies’ are not clearly defined, nor are they of regular size – while one society might have hundreds or thousands of members from a large area, another might consist of only a few houses on a small alley. Just as the design and the deity of a temple tells a story of the groups who live in the neighbourhood, the ethnic make-up of local temple societies reflect the patterns of migration into an area. The creation of a society to manage a temple has numerous purposes including, eliminating the appearance that a temple is an “income generator” since the funds are communally controlled as well as providing collective governance over the public space belonging to temple. ‘Societies’ also serve as a steering body to guide the development of the religious spaces they govern, if funds and space are available they might begin to plan for larger and more opulent structures. The decision to create a society is something that appears to arise among inhabitants in previously vacant spaces. If a new resident was to move into the area, they are likely to join one of the pre-existing local societies. Religious structures in unplanned areas such as Dharavi have a complicated relationship with government bureaucracy; some temples have been registered with the government, while others remain unregistered (2). The benefit of registration is primarily that the structure cannot be demolished without the permission of the temple’s governing body. Without registration a road widening or approved development scheme could mean the summary destruction of a temple or shrine. However, there are downsides to registration which keep many religious structures from doing so: registrations requires certain organizational and financial requirements to be met which can be onerous and restrictive. Because of this, many temples do not register unless it is absolutely necessary for example, when they are located on major roads where redevelopment is a threat. Demolition and movement: As stated above, temple buildings that have been registered with the government cannot be demolished without permission. However, when a new development that will result in the destruction of a temple structure is proposed, a deal is often struck between the local ‘society’ and the developer; wherein the developer builds a new space for the deity and the idol is moved from its old location. The density of religious structures and continuing redevelopment in Dharavi have made the temple relocation and destruction a constant process. There are reports of temples being constructed in a deliberate attempt to complicate and stifle development. However, I did not encounter this phenomenon during my research. Demolition of temples is further complicated by tales of disease and death befalling those that demolish temples forcefully. At least two temples are said to have caused the death or illness of the construction workers who attempted to destroy them. After these curses were recognized, deities were moved and new spaces offered. Surrounding space: Some temples in Dharavi are surrounded by what amounts to a relatively large amount of open space for such a dense neighbourhood. These spaces are used for both religious and secular activities. They become the neighbourhood square for those that live around them, areas where children play and people park their cars or dry papadams in the sun. However, during religious festivals, these spaces are taken over for meals, accommodation for devotees and congregational spaces. This communal space is limited to the larger temples that were established early on in the settlement of the area or the temples that have been newly rebuilt in high-rise housing. Temples or shrines that did not develop as quickly or as early can never hope to have this space and this issue will constrain their expansion. Informal development processes ‘regulate’ most of the construction in Dharavi and temples play an important role in preserving and expanding control of space. Religious sites can be used to ensure that land is left largely undeveloped with communal or even personal control. ‘Claiming’ a section of land as temple property, complicates if not halts, encroachments by neighbours or newcomers. Designated religious space represents one of the only means of justifying the retention of open space given the density and lack of regulation found in Dharavi. Age: There is a lot of confusion about the exact age of the Hindu temples in Dharavi. This lies in the willingness to claim that religious structures are as old as the hills because it increases the impression of holiness, furthermore, while the structures might have been rebuilt the idol itself may be much older, having come from a previous temple. The distinction between the age of the society and the idol and that of the structure in its current form and location in the neighbourhood is an important one when discussing age. For example, most of the structures appear to be fairly new, built in the last 50 years, however, there are some temples in Koliwada that date from the mid 1700’s. Cities have long been identified as sites where individuals are able to find freedom from the prejudices and social constraints of village life. The population of Dharavi is largely made up of lower caste Hindus, many of whom were refused entry into temples in their villages. Migrants who arrived in Dharavi found a place with almost no upper caste communities and therefore no one to regulate who could, or could not, worship a particular deity. As a result, previously marginalized castes began to build and enter temples without reprisal. The Bombay South Indian Adi-Dravida Mahajana Sang is an example of a society formed by ‘ex-untouchables’ who were emancipated from caste regulation in Dharavi. The society manages one of the largest temples in Dharavi. Originally, migrant workers arriving from South India began to settle in the area and worshiped a small idol that leaned against a tree. These workers began to plan for the construction of a proper temple-something that would never have been possible in their homelands. They felt free to do so in this community without a caste hierarchy. The temple they built is more than 100 years old, occupying a place of prominence in the neighbourhood. Faced with similar circumstances, some low caste hindus in Dharavi took another route and became Buddhists. The Ambedkar Buddhist movement is focused in the south western area of Jasmine mills where there are a number of large Buddhist temples. (2) The registration number can be seen often on the front sign of a temple.